What is the Autoimmune Paleo (AIP) Diet and How Can It Help Improve Symptoms of Hashimoto’s and Hypothyroidism? There are numerous dietary protocols that can help a person with Hashimoto’s feel better. In some cases, a dietary approach can produce a complete remission of the condition! For me, as a clinician, the goal of the approach is to help your body reset, nourish itself, and reduce inflammation caused by reactive foods, as well as to help you reconnect to an intuitive way of eating, where (eventually) you will naturally select foods that make you feel better and avoid those that make you feel worse. Dietary protocols are meant to be used as starting points, or templates, where you implement the basic plan and eventually change it up based on your needs. To keep it simple, I recommend sticking with the basic template for 30 days or so, and of course, make sure you reintroduce foods methodically, one by one so that you can isolate your body’s reactions to individual foods. First, let’s talk about the Paleo diet which is the diet from where AIP originates. Many people, even those not diagnosed with Hashimoto’s, are aware of the benefits of the Paleo diet. It has helped countless people feel better from a wide range of symptoms: fatigue, brain fog, joint pain, gas, and bloating, to name a few. In a survey of my readers and clients, a resounding 81% reported that they felt better on a Paleo or grain free diet. In the case of Hashimoto’s, the traditional Paleo diet has even helped many people lower—or completely eradicate—their thyroid antibodies. For those of you who have tried Paleo but have not seen significant improvement, I want you to know there are additional steps you can take that will give you the power to take back your health! The traditional Paleo diet is a classic elimination diet that focuses on omitting things people are commonly sensitive to in an effort to lower inflammation. As you may know, the Paleo diet eliminates all grains and all processed foods. The focus is on replacing the things you take out of your diet with nutrient-dense foods such as organic or grass-fed meats, wild-caught fish, organic vegetables and fruits, nuts, seeds, eggs from pasture-raised hens and, depending on who you ask, dairy. Anecdotally, the Paleo diet is said to have been introduced in the 1970’s with the book, The Stone Age Diet by Walter Voegtlin, but it has significantly gained in popularity over the past ten years. Since then, countless resources such as cookbooks, websites, and articles have been created that include recipes ready for you to use! I’m sure many of you have seen these resources at your local bookstore, your go-to health food store, and even at Costco! It’s a very exciting time to be on a Paleo diet! 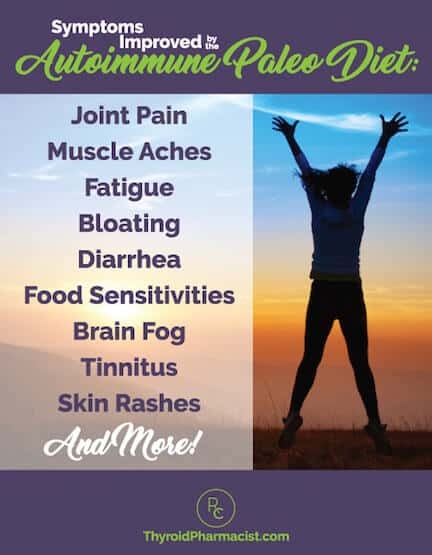 As for the Autoimmune Paleo diet, I don’t know who invented it, but I have seen it work wonders for many people with Hashimoto’s. If the Traditional Paleo Diet Does Not Improve All My Symptoms, What’s Next? Although the Paleo diet has helped some people with Hashimoto’s recover completely, I have found that the AIP diet can be even more helpful, based on 75% of my readers and clients reporting significant symptom reduction—and almost 40% seeing a reduction in thyroid antibodies—with this dietary protocol! On a personal level, this was one of the key protocols on my own healing journey and helped me get my condition into remission. 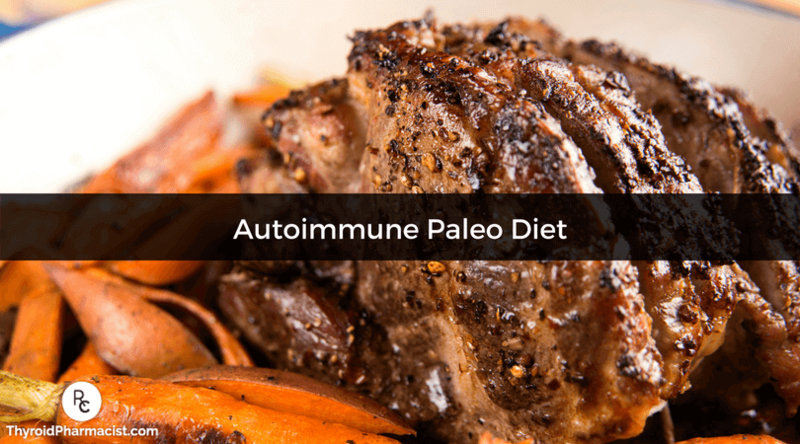 The Autoimmune Paleo diet has helped many people with Hashimoto’s and autoimmune conditions get better but can be quite difficult to implement. As a pharmacist, I see this daily, people who know what they need to do to get better but just don’t know how to get started. If you’ve been eating the standard Western diet for most of your life, starting a dietary protocol like the AIP can be extremely intimidating! Though you may eventually end up “going AIP,” it’s okay to take baby steps and begin with gluten free, then move on to dairy free and soy free. I encourage you to remove one food group at a time if that makes you feel more at ease with the transition. Committing to a 100% gluten free diet is an important first step, and 88% of my readers with Hashimoto’s have indicated that they felt better after going gluten free. I know that some of you will dive right in! However, many of you will find the AIP diet difficult to adhere to early on in your personal journey. We all have different needs, motivations, and challenges, and I encourage you to honor your individuality and listen to your body! *I recommend avoiding sea vegetables because of high iodine content which may exacerbate autoimmune thyroid disease. Don’t forget to check supplement labels to make sure there are not any non-compliant ingredients. For your thyroid medication, read Is Your Medication Gluten Free? What Are the Results and Benefits? There is often a short transition/withdrawal period before you start feeling better on the AIP diet, especially if you are new to coming off gluten, dairy, and processed foods. Research suggests that casomorphins (from the dairy protein casein) and gliadorphins (from gluten, the protein found in wheat) can bind our “feel good” endorphin receptors, much like the morphine found in addictive drugs. This has led some people to say that these foods are as addictive as heroin and other drugs (which also bind our endorphin receptors)… While I think this is an exaggeration, I have seen people experience withdrawal-like symptoms including brain fog, irritability, cravings, fatigue, and headaches, after quitting gluten, dairy, and sugar while adhering to the Autoimmune Paleo diet. The good thing is, once off these inflammatory foods, a person will start to feel better. You can expect to see results within 30-90 days of implementing the AIP diet, although it may take longer. If you do not see results in 30 days, eliminate mammalian meat and use fish as your main protein source. Then, you can start to systematically reintroduce certain foods one by one. This allows you to create a diet for the long term that is tailor-made for you! This process will allow you to be more in touch with what does—and doesn’t—work for you. I felt incredibly empowered when my grocery shopping and prep work resulted in a lasting improvement in health—and I know you will too! I have seen many of my clients find 100% relief from their symptoms by implementing the AIP diet into their lifestyle changes. The symptoms that many find relief of are joint pain, muscle aches, fatigue, bloating, diarrhea, brain fog, tinnitus, skin rashes as well as decreased food sensitivities. Even for those who do not recover completely, they will experience significant improvement. You have nothing to lose (except for symptoms!) and everything to gain by considering the AIP diet! What If AIP Is Not Enough? You may have to take it a step further and incorporate a rotation diet, a low-histamine diet, or low-oxalate diet, and you can find more information on these helpful protocols in my latest book Hashimoto’s Protocol. These changes are not permanent, so do not be discouraged! The Autoimmune Paleo diet is meant to be short term; it solves the problem of leaky gut and is not just a band-aid. These variations in diet give you the power to improve how you feel and isolate your root cause(s). After you are finished with the 90-day elimination period on the AIP diet, you may want to re-test your thyroid antibodies to monitor improvement. You should see a trend in your antibody levels reducing (or going away). If, after 90 days, you are still having gut issues, it may be a good time to test for parasites and other gut infections, as well as SIBO. On a personal note, eliminating eggs was a tough step for me, and although I knew I was sensitive to them, I put off excluding them from my diet. This delayed my progress for many months, and I don’t want that to happen to you! I’m sure many of you are thinking…what am I going to eat for breakfast? I know I asked this question! I used to eat eggs for breakfast almost daily, in omelets or scrambled eggs on weekdays, and every weekend my husband would cook a nice breakfast for us that included runny yolk eggs. However, the transition to life without eggs did not feel limiting after all. I found it made me more creative in the kitchen! Here are some meal ideas—my husband’s included! Breakfast, Courtesy of My hubby! Mineral water with lemon and lime or, for the occasional treat, add a few berries! Sip on some homemade bone broth, enjoy a root cause green smoothie, a slice of avocado with a squeeze of lime and sea salt (yum! ), or make some savory sweet potato chips! If you are interested in these recipes, you can find those and more in my FREE eBook: Root Cause Autoimmune Paleo Diet 2-week Recipe Plan! Remember, 75% of my clients saw a reduction in symptoms on the AIP diet, so it is definitely worth a try! I know that you can do it…and enjoy it too 🙂 Once you get going and see the progress you make, you will not want to turn back! I’d love to hear from you…what type of benefits have you seen from the AIP diet? The Flavor Chef (The Brothery) – Be sure to look for the products marked as AIP and use “thyroid10” for your special discount! Note: Originally published in July 2013, this article has been revised and updated for accuracy and thoroughness. Where do I start if I may have Lupus. 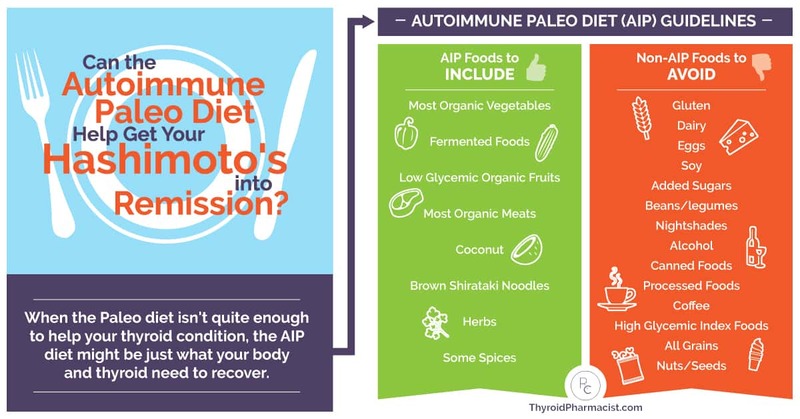 Do you recommend *starting* with the Autoimmune Paleo Diet if we have Hashimoto’s? Or do it only if we don’t see any improvement on the regular Paleo Diet? Izabella, I was so surprised to read your list. Prior to getting antibiotics for my Hashimoto’s rosacea (which have been MOST effective! ), I went to an ayurvedic practitioner. And the elimination of nightshades, peppers, alcohol, sugar, coffee, dairy, etc. is almost EXACTLY what they prescribed. The only problem for me is, the cure was worse than the problem! Jennifer – In general, most people with autoimmunity need to find their food sensitivities, heal from infections, and eat organic; however, bioindividuality is important, not everyone will respond to the same interventions. The foods that heal one person, may not be the same for another. It might seem like a lot to give up, but feeling your symptoms fade away can make it feel like it’s all worthwhile. And don’t forget it’s not forever! You will be reintroducing these foods once your gut heals. So do I understand correctly that I would do the AIP diet for roughly 2 months and then add in different categories of foods one at a time, to see if I see a reaction? How will I tell if the AIP helps my Hashimoto’s? How do you get enough carbohydrates on this diet? Evan – Recovering from adrenal fatigue and hypothyroidism when following a vegetarian diet is very challenging, as vegetarian diets are often carbohydrate heavy. Vegetarian sources of protein such as legumes (beans), dairy, grains, soy and some seeds may be incompatible with trying to heal a leaky gut, which is almost always present with Hashimoto’s. Pea protein is an alternative that may be easier to digest and is less likely to cause food sensitivities (I use NOW Foods brand). Eggs, some seeds, and nuts would be the preferred sources of protein for vegetarians, however, some people with Hashimoto’s may be intolerant to those as well, especially in the early stages of starting a healing diet. Being a vegan is even more challenging, and nuts and seeds would be the go-to source of protein, which are usually too difficult to digest for many in the beginning of their thyroid healing journeys. Additionally, many former vegans have reported improved symptoms of Hashimoto’s following transitioning to a Paleo diet. Based on this, I believe that animal proteins must play an important role in building back the health of people with Hashimoto’s. That said, while meats and fats are important for healing, eating them exclusively will produce an acidic environment in the body; hindering healing, and thus the diet should be balanced with plenty of nutrient rich vegetables (suggested ratio may be 20% meat/80% veggie). Additionally, vegan and raw vegan diets can be extremely helpful for cleansing and detoxifying, especially for those with persistent protein digestion issues. A vegan diet can be followed for a few days to a few weeks and may help the body detoxify. B12 and iron or ferritin supplements should be utilized at this time to prevent deficiency. If meat takes forever to digest and is void of needed fiber, how then are nuts and seeds the culprits for being difficult to digest? Hi Evan, I’ve had the same problem as you. I have been vegetarian for over 30 years. Since my health was compromised I started the AIP diet. The first month has been challenging to say the least. It was very uncomfortable but I promised myself I would give it a month to see if the blood works got better. After a month I could start introducing new foods and when I tested after 3 months my blood was much better. Then a alternative dietist advised me to eat more protein, in the form of pea protein and although this was good, she advised me to eat some fish. I felt awful and prayed for the fish but I tried since my fear of medicine was bigger than my determination to exclude animal protein. My health got so much better that my blood has been in normal range after 6 months. I eat fish sometimes, mostly once a week, sometimes twice and stick to pea protein daily or an egg. It felt like me or the animal. It helps if I thank the animal before I eat it, for its help in my health journey. Meat is one step too far so I don’t eat that. Good luck on your path! I have had Hashimoto’s for a very long time, and am at the stage where additional autoimmune problems are manifesting. I live in a rural area, and none of the drs. around here have a clue as to how to treat Hashimoto’s. As such, I have been on a daily regimen of Levothyroid and Cytomel for many many years. With that said, I am 99% sure that I have an allergy or sensitivity to gluten and dairy. I am aware that I need to eliminate these from my diet, along with several others foods as well. However, because I am a very picky eater and the majority of the foods listed in the autoimmune paleo diet, and the cookbook, are not things I would eat. Suggestions for a picky eater? Alicia- You may be interested in checking out the Root Cause Recipe Portal. It is full of autoimmune paleo and paleo recipes. You’re able to organize weekly shopping lists, meal planning, etc. Hope you check it out. I just wanted to THANK YOU for being so responsive to everyone’s questions. I’ve learned so much just from reading all your responses. I suffer from acid reflux mostly wakes me up at night. I have hashimotos and take synthroid for 20+ years.what can i do besides taking rolaids. Would drinking lemon water help? Jill – I highly recommend that you work with a functional medicine clinician. It’s an entire medical specialty dedicated to finding and treating underlying causes and prevention of serious chronic disease rather than disease symptoms. I was diagnosed with hypothyroidism in my 30’s. In my 40’s, I was told I had Hashimoto’s and now in my 50’s, I have been told I have type 2 diabetes. I have been overweight for years and am having other symptoms such as swollen joints, joint pain (primarily hips), severe tiredness, no energy, mental fog, forgetfulness, indigestion and bloat. I do not take medication for diabetes yet although that seems to be the only thing my doctor is concerned about. I am wondering what your thoughts are about this diet and diabetes. I know that I would probably not be able to eat enough carbs as suggested by my doctor to maintain blood sugar levels. Robyn – please, understand that due to liability issues, I am unable to answer specific medical questions. I have a history of multi thyroid nodules for years, tested and was cleared as non-cancerous, with my TSH results always running on the lower side of norm,somewhere between 0.4-0.5 my endo doctor always sent my home with normal results BUT I know I am not well. Thank you so much for all you do, please inform me does my condition with nodules and low TSH indicates hypothyroidism or hyperthyroidism?? Please help me understand. I am in the process of finding functional medicine practitioner in Chicago area but its not so easy. Am I hypo or hyper? Thanks so much in advance. Lena – Thank you for following this page. Please, understand that due to liability issues, I am unable to answer specific medical questions. I’m glad that you are searching for a Functional Medicine Clinician. You may wish to check out the doctors that other patients recommend on this list. Hi. I have hypothyroidism and also vitiligo. Should I start for the food sensitivities test first or just start with the autoimmune paleo diet? Have you seen in your practice people with these two conditions getting their pigmentation back after healing their thyroid? Thank you! Ana – thank you so much for following this page. Hi Izabella – Thank you for your informative site. My father has Hashimotos and I have recently been working with a provider for my apparent leaky gut. I was vegetarian for about 15 years and while I eat well, with lots of organics, I realize now I ate too many carbs. Since my we have a family history, I’m following the autoimmune diet for healing. I adore eggs, nuts, legumes. It’s very difficult to eat meat, but I’m finding that easier with bone broth and small amounts of high quality beef and chicken. My healing journey started with the discovery that if I drink fluoridated water, I get horrible migraines. When I cut out tap water and started drinking spring water known to be F-free, my health greatly improved. I also cut all foods known to be high in F, like grapes. I’m curious if you advise those living with auto-immune disease or those at high risk to cut out fluoride, esp. fluoridated water? I see you have it listed as a risk factor for Hashimotos and I’ve also seen it’s linked to hypothyroidism. I’ve been drinking fluoridated water since I was 7 and can’t help but wonder if it’s played a major role in my migraines and digestive woes. I know you can’t speak to my case, but I’m curious what you’ve observed on this topic. Julie – thank you for following this page. Please, understand that due to liability issues, I am unable to answer specific medical questions. Sorry if this is long. I have hypothyroidism along with rheumatoid arthritis. Last summer I began the Low Dose Naltrexone protocol with a knowledgeable functional medicine doctor. Four weeks ago I began to have erratic (high to normal) bp issues along with high heartrates. Went to the ER 2X, saw my pcp 3X, saw a cardiologist, had loads of tests and my heart was deemed “normal”. I called my func. dr. who told me to quit the LDN as I may have developed allergies because of it (or to it). I see him next week. My pcp thinks I may have a parathyroid issue but I’m waiting several days to be tested to get the LDN out of my system so it’s more accurate. I was placed on 2 new bp medications, for 2+ days I had more normal bp and heartrate—that is until today. I’m thinking now I do have allergies to whatever I’m eating. I also want you to be aware that for 5+ yrs I’ve been on the Wheat Belly protocol so have already eliminated grains, processed foods, sugars, soda and more recently dairy from my diet. Have you ever run across anyone similar to what I’ve been experiencing? I’m looking at the AIP diet and it seems almost impossible to think about. I know that it could be temporary and it is a mind-set. Can you help give me words of wisdom?? Was diagnosed with Hashimotos 8 months ago… went gluten free…. blood work was still bad 3 1/2 months ago… went full AIP 3 1/2 months ago… feel great, thinking I’ll try to make it 6 months and then try to reintroduce some foods…(I use to daily drink for 25 years, so want to give it more time to keep healing) 49 years old and went from 289 to 215 in the past year…so happy….I also am only eating between 12-8pm….feels great!!!! Stephen – thank you for following this page. It depends on the person and their individualized food sensitivities. Some people go into remission just gluten free; others may have to go as far as autoimmune Paleo. The most common triggers in Hashimoto’s are nutrient deficiencies, food sensitivities, intestinal permeability (leaky gut), stress, an impaired ability to get rid of toxins and in some cases, infections. Optimizing your health starts with food. Figuring out which foods nourish you, and which ones cause you harm is the single most important thing you can learn in your health journey. I am an avid reader of your blog and books and a huge fan of your documentary series. Just wanted to take a moment to thank you for all you are doing. It is because of you I am currently healing my body and in tern, living an extremely fulfilling life. Thankfully my physical symptoms were never debilitating but mentally they grew to be. It’s because of you, and all those involved in your documentary series, that enabled me to take hold of my health, never accept what my current medical doctors were telling me and to find TRUTH. Thank you. Thank you for all you do in sharing this blessed knowledge with the world. I’m looking forward to hearing your progress on this page. I would like to try incorporating green smoothies in my diet. I am currently avoiding foods I have tested sensitive to and am on a 4 day rotation diet. I am concerned about having the same ingredients in my smoothie every day, specifically the protein powder and the coconut milk as I think I can rotate the other ingredients such as the fruits and vegetables. Any suggestions for alternatives for the protein powder and coconut milk on alternate days? Cindy – thank you for following this page. You may be interested in my 12 week online program called Hashimoto’s Self-Management Program that covers all of the strategies that I go through with my one-on-one clients, in a self-paced format, so that participants have access to all of the things I’ve learned about Hashimoto’s without having to schedule costly consults with me or another practitioner. In addition, any person that goes through the program will get access to a Quick search Q&A Database of 1000+ questions asked by past program participants, Root Cause Assessment based on 100’s of my clients’ root causes and triggers, 2-week Meal Plans, recipes, and shopping lists to get you started on the following diets: Paleo, Autoimmune Paleo, SIBO, Candida. Also, Discounts on lab tests, high-quality supplements, and consultations and much more to support you in your journey! There are a few requirements that you should pay attention to, such as my book is a required read. It would be nice if you had a website that you could pay a nominal fee and I mean nominal to address simple questions for people struggling. It takes so long and now costs so much to get into a functional medicine doctor. Be the first Isabella to truly help those of us who are dying to live. Melinda – thank you for following this page. Please, understand that due to liability issues, I am unable to answer specific medical questions. I feel like I am starving trying to eat bananas instead of organic brown rice, but they don’t have the same nutrients and I have the symptoms of low Vit B1. Se/niacin/protein and more are in the organic brown rice. I am too dizzy/inflammation/swollen/leaky gut/nails bend/got new varicose vein/could not think/no energy etc…trying to eat organic brown rice again. The first day is fine, but by day 3 my intestines are hurt and many symptoms are kicking in. I can’t eat meat/dairy/soy/high sugar/food with a label/gluten/heated oils/saturated and monounsaturated fat etc. My adrenals are burned out…stage 3+ maybe. Meat/coconut oil/olive oil clogs my blood vessels. I try to eat organic. I need more than vegetables…need a carb. Sugar/starch causes glycation. I still have Lyme. My mitochondria have been hurt too many times. What has the same nutrients as organic brown rice, but no gluten. I think quinoa etc in a package has contamination and is expensive. Thanks! Shasha – Thank you for following this page. Please, understand that due to liability issues, I am unable to answer specific medical questions, but I highly recommend that you work with a functional medicine clinician. It’s an entire medical specialty dedicated to finding and treating underlying causes and prevention of serious chronic disease rather than disease symptoms. I was diagnosed with Hashomoto’s a month ago. I’ve been sick for 4 years. For the last month I’ve been following gluten-, soy-, dairy-, caffeine-, sugar-, grain-, potato-, alcohol-free diet. It’s been tough. I never feel full. I’ve gained more weight. I eat lots of vegetables, salads, meats though I always have. I’d like to try the AIP diet but I got Alletess food sensitivity test done. And It shows reaction to lettuce, mushrooms, carrots, spinach, green peas, coconut, watermelon, almonds, salmon, different spices like cinnamon, oregano, nutmeg etc. among other things. Would AIP diet be advisable for me or should I go by what the food sensitivity test say? If I illuminate all of my reactive foods + nightshades + legumes and limit fruit to 1 serving (half an apple?) also I’m not a huge fan of meat I’m looking at a diet that’s really hard to maintain — meats, carrot-free bone broth, extremely limited selection of vegetables and 1 fruit per day. It doesn’t sound very healthy, honestly. Am I understanding the necessary dietary changes correctly? Would it be ok to include non-reactive foods (according to the food sensitivity test) like rice, tomatoes, eggs into my AIP diet? Lola – thank you for following this page. In general, most people with autoimmunity need to find their food sensitivities, heal from infections, and eat organic; however, bioindividuality is important, not everyone will respond to the same interventions. The foods that heal one person, may not be the same for another. It might seem like a lot to give up, but feeling your symptoms fade away can make it feel like it’s all worthwhile. And don’t forget it’s not forever! You will be reintroducing these foods once your gut heals. first thank you for the amazing work you do in giving us informations which help. I live in Germany and Functional Physicians aren’t here. I hold on to your nutritional advice since a year , strict AIP . And I have followed your plan outlined in your book how to find my root causes. However eating AIP didn’t seem to be enough! I had to dig deeper. Among other root causes physician found out I have Histamine intolerance. DAO is too low, the causes are genetical. I love your recipies, but they all don’ t consider HIT. No batch cooking, no left overs, all your good and so supportive nutritional advice…now I can’t use it. I will keep your suggestion in mind and look forward to hearing your progress on this page. My wife will be getting tests done shortly, and if she also has both of these conditions, we will let you know what is recommended to us. I do think Izabella does very well to emphasize bioindividuality since all people will react different to different foods. So, everything must be taken individually, but I hope the community of people with these disorders can help each other. I was wondering where flours Fall into this program (like coconut flour, almond flour, etc) and are they okay to consume? Britlie – thank you for following this page. Here are a few articles related to diet that hopefully help you get started. After watching the Thyroid Summit I began the AIP Diet on March 23, 2017. I have been Gluten Free, Soy free and egg free for 2 years and taking Nature-Throid. I weighed 194lbs. 12 weeks later and I have lost 34lbs! Everytime I step on the scale I’m afraid to check but am always excited to see a few more pounds lower. My Dr. was really impressed. I feel so amazing and I wish I would have tried this sooner! Don’t be afraid to dive in and try AIP, you won’t regret it! I'm currently collecting success stories and my goal is to collect 10,000 in hopes to submit them to a medical journal. I know it's a lot to ask but would you mind submitting yours? I was dignosed with Hashimoto’s this past January, and I started following your protocol a couple of days ago. When you mention that Kombucha is ok for an AIP Diet, are there any restrictions? I know almost all Kombucha has caffeine. Just want to make sure it is ok.
Débora – thank you for following this page. Kombucha can be helpful sometimes, but I recommend proceeding with caution, as some people may have adverse reactions to the wild yeast. I prefer probiotics and fermented foods. You may be interested in my 12 week online program called Hashimoto’s Self-Management Program that covers all of the strategies that I go through with my one-on-one clients, in a self-paced format, so that participants have access to all of the things I’ve learned about Hashimoto’s without having to schedule costly consults with me or another practitioner. In addition, any person that goes through the program will get access to a Quick search Q&A Database of 1000+ questions asked by past program participants, Root Cause Assessment based on 100’s of my clients’ root causes and triggers, 2-week Meal Plans, recipes, and shopping lists to get you started on the following diets: Paleo, Autoimmune Paleo, SIBO, Candida. Also, Discounts on lab tests, high-quality supplements, and consultations and much more to support you in your journey! There are a few requirements that you should pay attention to, such as my book is a required read. I literally blew my doctors away with the degree of success I’ve had on the AIP diet. At the beginning of this year, I told both my GP and my endocrinologist that I was tired of treating the symptoms of my disease with pharmaceuticals and intended to heal my body with food, with a goal of being off all prescription medication except thyroid hormones by the end of the year. They were not optimistic. I said, “Watch me”; they shrugged. Both my endo and GP were stunned and thrilled when I saw them after having followed the AIP protocol for 90 days. They could not stop crowing about how amazing I looked and how beautiful my bloodwork was. LDL cholesterol (the bad one): before – 115; after – 86. My endo was so overwhelmed she had me write down all the resources I used to get these incredible results (are you sitting?) so she could use them to help her other patients! Of course I started with “Finding the Root Cause,” and included your website and your newest book, along with links to Paleo Mom and Hypothyroid Mom. I wish you could have seen the looks on their faces! And guess what? They took me off statins and off blood pressure medication, with Metformin elimination only a couple of months away. I cannot thank you enough for the vast amount of great information and resources you make available to men and women like me who have been suffering for years using conventional treatment only. It has saved my life. I'm currently collecting success stories, and my goal is to collect 10,000 in hopes to submit them to a medical journal. I know it's a lot to ask but would you mind submitting yours? Hello Isabella, I have a question I was hoping you could help me with. I have been trying to follow Bright Line Eating (no sugar, no flour) and found that I was putting on weight despite being on BLE. I have subclinical thyroid levels and I’m seeing a Naturopath. The treatment seems to be going well. I have read that dairy is in the “NO” list. I take about 1 oz of milk in coffee / black tea and I have about 2 cups of coffee with milk and 2 cups tea with milk almost every day. Is this a problem if I have no other form of dairy? I have been quite good about giving up flour and sugar but am finding it difficult to give up milk with the hot beverages. I have a stressful job and I have a cup of tea with milk helps me get my work done. Anne – thank you for following this page. Going gluten free is always the first step that I recommend. Through my research, I’ve found that a good percentage feel better off gluten. About 20% will actually go into remission by doing so. Some researchers have found that three to six months on a gluten-free diet can eliminate organ-specific antibodies. To avoid painful swelling in my left hand I’ve had to cut out wheat, corn and rice — even black rice which is not inflammatory according to some but it definitely is for me. Not sure about quinoa. I also have to avoid sugar, wine, beef and nuts. For me, dairy, eggs, coffee, and potatoes do not cause a problem so far. Becca – thank you for following this page. Here are a few articles related to diet that hopefully help you get started. I’ve been paleo for 6 months now. I wake up at 6 full of energy. My dr. Has lowered my synthroid. I still won’t give up my wine though. I love it and enjoy a bp coffee 4 times a week. I’ve lost 20 lbs by going grain, dairy and sugar free. Feel awsome. Thank you Dr. Isabella. I came across through thyroid secret guide by accident and it changed my life. Thank you!!! That is amazing, and I'm so happy for you. I'm currently collecting success stories, and my goal is to collect 10,000 in hopes to submit them to a medical journal. I know it's a lot to ask but would you mind submitting yours? A warm thank you for the wisdom, experience and love you have put into helping others with Hashimoto’s. 1) I am a vegetarian and the AIP diet is not an option for me. I went back on fish for awhile but with most seafood being radioactive from Fukushima, it’s not worth the risk (for me) so I went off again. Eggs have been my primary source of protein. I’ve been off gluten for about 10 years. But I’m feeling pretty discouraged with how limiting this will be & it scares me I will go off. Are there other options? 2) Would it be more beneficial to have the tests done first before starting a 90 day diet in case there is an underlying infection going on? Jolene – thank you for following this page. Jolene – thank you for following this page. In general, most people with autoimmunity need to find their food sensitivities, heal from infections, and eat organic; however, bioindividuality is important, not everyone will respond to the same interventions. The foods that heal one person, may not be the same for another. It might seem like a lot to give up, but feeling your symptoms fade away can make it feel like it’s all worthwhile. And don’t forget it’s not forever! You will be reintroducing these foods once your gut heals. I have been AIP for almost 8 weeks now. I read today that people with Hashimoto’s can be triggered again by even a molecule of gluten that may drift onto the GF food at a restaurant and the have antibodies go back up for 8-9 months after this exposure. Is this true? I have been absolutely GF, as far as I know. But I have eaten the occasional grilled chicken salad at a restaurant where it wasn’t marinated in a GF dressing. Do we have to be so careful as to request glove changes at Chipotle and separate pans at restaurants? Jen – In contrast to other diets that simply exclude common problematic foods, an elimination diet is done to determine what particular food intolerances the individual may have. An elimination period of at least 2-3 months is a good starting place, but you may want to continue if you feel that you still have more healing to do. Then you can trial a new food every 4 days and monitor yourself for reactions. Going though an elimination diet will help you figure out your own individual food triggers and your specific response to each trigger food. Here is an article I hope you find interesting! Thanks for your reply! Do you know if we need to avoid gluten to such an extreme level? For instance, replacing all kitchen tools and avoiding eating out completely? Do you do this for yourself? Also, when re-introducing foods, for someone like me who has no symptoms b/c antibodies are barely elevated, how do I know if a reintroduced food is okay or not? Jen – thank you for following this page. In contrast to other diets that simply exclude common problematic foods, an elimination diet is done to determine what particular food intolerances the individual may have. An elimination period of at least 2-3 months is a good starting place, but you may want to continue if you feel that you still have more healing to do. Then you can trial a new food every 4 days and monitor yourself for reactions. Going though an elimination diet will help you figure out your own individual food triggers and your specific response to each trigger food. Here is an article I hope you find interesting! i have started reintroduction of food and start with egg yolk, and after 3 time he complain stomach pain and i have introduced 10/6/17 and blood test done on 5/7/17 and TSH raise 16.42. whether reintroduction fails can raise TSH level. Suryabhan – thank you for following this page. In general, most people with autoimmunity need to find their food sensitivities, heal from infections, and eat organic; however, bioindividuality is important, not everyone will respond to the same interventions. The foods that heal one person, may not be the same for another. It might seem like a lot to give up, but feeling your symptoms fade away can make it feel like it’s all worthwhile. And don’t forget it’s not forever! You will be reintroducing these foods once your gut heals. I recently purchased the AIP meal portals. I have 2 questions. Can lunch recipes be used for dinner? Above it states to avoid all sweeteners including honey. Several of the recipes call for honey??? So far all of the recipes are delicious! Susan – thank you so much for your support. I am so happy you are enjoying the recipes. :) Please contact my team at info@thyroidpharmacist.com and they will be happy to help you. Hi Dr. Izabella Wentz and thanks for all informations you share here. I write from Italy to ask you an advice. Some months ago, i was always felt tired, with headache, suffering pain on my back and having a lot of problems with my mood… well, actually i don’t exactly know what is really related to the disease… all doctors say that i don’t have anything, but i decided to go ahead for myself. After tiroid analysis i have found Hashimoto’s, with values TSH 0.89, FT3 2.83, Anticorps anti-thyroglobuline 579,3 (in a range of about 20-30 if i remember well), anticorps anti microsomal 307,8. But, most of all patients have a lot of collateral effects, including tachycardia, mood swings, etc. – D3 Vitamin (5000units, once a day), selenium (1 capsule/day 100mg), serotonin (1 capsule/day). Sorry for my english and thanks again. And i’ve made some progress thanks to you!! Anticorps anti-thyroglobuline 58,6 (ten times less than last time!) and with this i’m in the correct range value. I’d like to continue this diet to try to continue decreasing these values. Also, i’ve experimented some fermented foods, such as water kefir with coconuts and fermented vegetables (these are the only that i can eat cause of my intolerance for the others you listed on this page…), but i always felt swollen and constipated. I’m almost done reading your Hashimoto’s Protocol book and I’m going to start my 90 day diet in two weeks! I have a questions about using organic raw honey during the 90 day diet? This was not mentioned in the book, is this safe to use? Thank you for your time!! I’m wondering if you’ve seen patients that have hypothyroidism and asthma? My Dr. and I can’t figure out why my asthma kicks in shortly after taking the medication and we’ve tried a few different things. I’m in Canada so we don’t have access to the variety of medications that you do in the States. I’m working hard on the leaky gut issue, AIP diet, and a host of other things but I’d love to know if you’ve heard of any connection between hypothyroidism and asthma. Deb – thank you for following this page. While I only work with patients with Hashimoto’s, oftentimes patients will have additional autoimmune conditions. Most autoimmune conditions have common root causes, and a lot of times the things that are recommended for one autoimmune condition will help with others. Conditions that I have found to respond really well to the Hashimoto’s protocols have been rheumatoid arthritis, lupus, Celiac disease, irritable bowel syndrome, eczema, asthma, Graves’, premature ovarian failure, psoriasis, Alopecia Areata, and Sjogrens. I have also seen the protocols help with Fibromyalgia, chronic fatigue syndrome, PCOS, as well as Type 2 diabetes, Crohn’s, and Ulcerative colitis. I was diagnosed with Hashimoto several years ago. I made some small changes and was able to quit my meds very soon. I check my thyroid levels and visit my endo every quarter or so. I recently started feeling foresaken and anxious. My T levels were under control but my TPO was higher than when I was diagnosed (I haven’t checked them in between, just those two times). So I started the AIP, since I really didn’t want to feel anxious not lonely I also started taking magnesium citrate and thiamine (in lower doses than your articles about the nutrient deficiencies). Within few days I started feeling better; no more loneliness and no more anxiety. But I feel kind of stuck. I am also constipated and very gassy. Is it normal? Every since I started AIP I was also very hungry, even 30 min after a meal when I had felt full. At the beginning if I did not eat when I was hungry I will feel like depressed, took me a few days to discover the link. So I will eat and I will feel better. It does not happen anymore (to feel depressed if I don’t eat when I am hungry) but the constant hunger continues. Is it normal and part of the healing process? How to know when to reintroduce the foods? I’ve read that some do after 30 days, some later (even years later!). If I am not feeling neither anxious nor foresaken can I say it is safe to start the reintroduction foods? Or is my TPO supposed to lower after the AIP (should I testing it again to see if it lowers?). Is it common to have my thyroid levels under control but my TPO to be higher? Also, if my soap is made with not oils such as safflower, castor, sunflower, etc. does it mean that I’m not AIP compliant at all? Sorry I meant, soap made with ** not compliant** oils such as safflower, castor, sunflower, etc. Liv – thank you for reaching out. We know that intestinal permeability (aka leaky gut) is present in every case of autoimmunity and often precedes the development of Hashimoto’s. Symptoms of leaky gut may include bloating, diarrhea, constipation, stomach aches, acid reflux and irritable bowel syndrome. According to the Institute of Functional Medicine, many people develop IBS 5-10 years before an autoimmune diagnosis. I was one of them and didn’t take my gut health as seriously as I should have. Gut problems are often caused by infections like H. pylori, parasites like Blasto, SIBO, an imbalance of bacteria, and enzyme deficiencies or food sensitivities (especially to gluten, dairy, and/or soy). Even stress can be a factor in gut permeability. Here is an article you might find interesting. I have celiac and Hashi’s. I started the autoimmune diet six weeks ago and am feeling good. My problem is weight loss which I do not need. I’m loosing a pound a week & don’t want to lose more. Any suggestions? 1. Get a calorie counting app like My Fitness Pal on your phone, to help you keep track of your daily calories. Eating real food can be more filling than eating simple carbohydrates and you may not be getting enough calories. Use the app to figure out your target weight and the number of calories per day you need to get there. 2. Supplement after dinner with The Root Cause Building Smoothie: 1 avocado (300 calories), 1 cup coconut milk (150 calories), 1 banana (100 calories), 2 egg yolks (100 calories, if tolerated), 1 scoop of protein of beef/pea protein (60 calories) – You can also add cooked sweet potatoes if you need more carbs. 3. Get tested for gut infections. Gut infections can prevent the digestion and assimilation of foods, leaving you underweight and malnourished. The 401H test or GI Effects test are my go to tests. 4. Get your adrenals tested with an adrenal saliva tests. In some, stressed adrenals may actually lead to poor absorption of foods. 5. Be sure that you are not over medicated. 7. Stress reduction, when we’re stressed we don’t digest. 9. Avoid caffeine, it can make you less hungry and stress out your adrenals. With the paleo diet or at least low carb incl. taking supplements, I started to eat meat again regularly as suggested (beef/ organic). I thought it might be good as well to increase ferritin. However it seems – in my case – eating meat has caused an inflammation (sinusitis). The first days I felt pale, then started getting shadows around the eyes and finally a swelling around the nose. Is there a chance that the supplements like Vitamin B complex, B1, Vitamin D, Zinc, Mangan, NAC can cause inflammation? My nutrition is already strict avoiding gluten, sugar, coffee, nightshades, dairy and no processed food at all and 100% organic. Anyway, I’ll avoid meat and see if it will make a difference. I have been diagnosed with hashimoto a good 11 yrs ago, but since the last 1 yr started taking levathyroxin. But I believe I have hashimoto since childhood ( very visible goitre since grade 7 /8 now I am 40+) I have your “root cause book” and feel really good and after going gluten free. Now with a recent outbreak of shingles and thyroid inflammation I am seriously thinking about followig AIP. At the end of your book you recommended supplements with breakfast like selenium. Could I take those breakfast supplements with my thyroxine or there should be a gap,and what should I do for the inflamed goiter will AIP also help for that. Sana – thank you for following this page. Nodules and goiters are often the result of toxicity and/or the autoimmune process. So, doing interventions to reduce the autoimmune attack on the thyroid, and toxicity, can be helpful to reduce them. Have you read my books? I was diagnosed with Hashimotos approximately 6 months ago. I am a 20 year old college student and it’s been so rough.im still drinking the pills prescribed but they are not working I’m am frustrated and can’t find a way out. Because I’ve changed my endocrinologists twice but they are not talking to me. They just increase the dose and hope it works. I really need help. Is there a kind of doctor I can visit that will help me through this diet. I know I can start the diet on my own but I want to be able to know if it’s working. And do I stop drinking pills? Keila – thank you for following this page. My heart goes out to you. I highly recommend that you work with a functional medicine clinician to be a part of your own health care team. It’s an entire medical specialty dedicated to finding and treating underlying root causes and prevent serious chronic disease rather than treating individual disease symptoms. Going gluten free is always the first step that I recommend. Through my research I’ve found that a good percentage feel better off gluten. About 20% will actually go into remission by doing so. Some researchers have found that three to six months on a gluten-free diet can eliminate organ-specific antibodies. You might find these articles helpful as well. Eve – thank you for reaching out. I have seen many of my clients find 100% relief from their symptoms by implementing the AIP diet into their lifestyle changes. The symptoms that many find relief of are joint pain, muscle aches, fatigue, bloating, diarrhea, brain fog, tinnitus, skin rashes as well as decreased food sensitivities. Even for those who do not recover completely, they will experience significant improvement. You have nothing to lose (except for symptoms!) and everything to gain by considering the AIP diet! Eve – thank you for reaching out. We know that intestinal permeability (aka leaky gut) is present in every case of autoimmunity and often precedes the development of Hashimoto’s. Symptoms of leaky gut may include bloating, diarrhea, constipation, stomach aches, acid reflux and irritable bowel syndrome. According to the Institute of Functional Medicine, many people develop IBS 5-10 years before an autoimmune diagnosis. I was one of them and didn’t take my gut health as seriously as I should have. Gut problems are often caused by infections like H. pylori, parasites like Blasto, SIBO, an imbalance of bacteria, and enzyme deficiencies or food sensitivities (especially to gluten, dairy, and/or soy). Even stress can be a factor in gut permeability. Here is an article you might find interesting. My name is Blanca, I’m from Mexico. I was diagnosed with Hashimoto hypothyroidism four years ago when I was 55 and since then I take 100 mg levotiroxina every day. I didn’t know anything about this disease until I began to read your extraordinary book “Hashimoto, Causa Raiz” and all the information of your website. Thank you very much. I am decided to make many changes for dealing with fatigue, join pain and other symptoms. I’ll try the Paleo Diet, but I am vegan and I don’t know how to supply the animal protein. I’ve been eating soy, fungi, legumes and grains, but now I’m not sure what I have to do. Can you please help me? How can I be vegan and deal properly the root cause? Blanca – thank you for reaching out. Recovering from adrenal fatigue and hypothyroidism when following a vegetarian diet is very challenging, as vegetarian diets are often carbohydrate heavy. Vegetarian sources of protein such as legumes (beans), dairy, grains, soy and some seeds may be incompatible with trying to heal a leaky gut, which is almost always present with Hashimoto’s. Pea protein is an alternative that may be easier to digest and is less likely to cause food sensitivities. Thank you very much for your response. This information, along with your books, helps me a lot to reorganize my diet to deal with Hashimoto’s disease. I noticed that in the “foods to avoid” list, it mentions honey but in the 2 week meal plans, it includes honey in several recipes. So, should I use it minimally or not at all? Is it ok to use other natural alternative sweeteners? I was diagnosed with Hashimotos. I have just about eliminated all my symptoms with diet and supplements but cannot seem to lose the 60 lbs that I gained. Could this be the last key to getting my thyroid working properly and losing weight? Christy – thank you for reaching out. Sugar is not allowed on AIP, however, honey because it is a natural product is allowed in small amounts. I hope that helps. It’s wonderful that you have eliminated many of your symptoms with diet changes. When it comes to weight gain these are a few things to think about. Hi, I have Hashimotos and resorted to the AIP diet after being medicated and not seeing results. The Dr. believes it could be because my body is not absorbing the medication due to the fact that I regularly use the restroom about 5 times a day, often diarrhea. I am six days in and feel physically well. I am using the restroom much less, but I feel bloated and my stomach is observably more distended than usual. I do plan to stick with the diet for 30 days, but this I am just wondering if this is normal? It’s quite uncomfortable and a little discouraging to be following the diet so rigorously, but feeling even more bloated. Sylvia – thank you for reaching out and sharing your journey. <3 We know that intestinal permeability (aka leaky gut) is present in every case of autoimmunity and often precedes the development of Hashimoto’s. Symptoms of leaky gut may include bloating, diarrhea, constipation, stomach aches, acid reflux and irritable bowel syndrome. According to the Institute of Functional Medicine, many people develop IBS 5-10 years before an autoimmune diagnosis. I was one of them and didn’t take my gut health as seriously as I should have. Gut problems are often caused by infections like H. pylori, parasites like Blasto, SIBO, an imbalance of bacteria, and enzyme deficiencies or food sensitivities (especially to gluten, dairy, and/or soy). Even stress can be a factor in gut permeability. Here is an article you might find interesting. I’ve just finished your book “Root Cause” and have been grain free and dairy free (egg free too) since Jan. 1 2019. (9 days) I’ve struggled with Hashimoto’s for 13 years. My antibodies (I have both hashi and graves antis) TPO antibodies at one time were >10,000. (YES over ten thousand!) higher than my functional med doc as ever seen. I’ve always had symptoms, no medicine has ever made me feel 100%. I take Synthroid and Cytomel and have for years now. I finally understand that its not all about the thyroid and have been implementing many supplements and dietary changes. One of the most amazing things Ive noticed since starting this diet/new way of eating is that my brain fog, that Ive had all day every day for 13 years (after every meal) is gone! completely gone… I have very strong blood sugar swings (I am very petite and thin and sensitive to everything) so I believe this was a big part of it. I am just starting this journey back to good health but am so encouraged by this that I had to comment. Do you have a blog or something else for discussion/communication purposes? One question I have is about a supplement that you recommend in your book-N Acetyl Cysteine. My functional med doc has also recommend I try it. However, I am a research junkie and am concerned about PAH associated with this supplement. What are your thoughts on this? Is this something that we might expect with any excessive dosing of ANY antioxidant or is it more likely that it is specific to N Acetyl Cysteine itself? Jamie – thank you for reaching out and sharing your journey with me. <3 That's a great question and unfortunately I don't have any information to share with you at this time but, I will add this to my list to research. I would recommend that you to discuss this with your clinician. I have discussed it with him. Unfortunately he no information either. Thank you for sharing your research/knowledge with the world- I look forward to reading the next book.. And thanks for the quick reply! I’m struggling with constipation and have been for several months. Even though I take the correct supplements to get things going (magnesium, probiotics etc) it doesn’t seem to matter if I don’t have a cup of coffee in the morning. It’s very frustrating since I’m really dedicated to follow AIP and heal my leaky gut. Being constipated for weeks just doesn’t feel like an option and can’t be much better for my body, right? Can I heal my leaky gut without fully excluding coffee? I’d so appreciate your advice on this topic. Hanna – thank you for reaching out and sharing your journey. I am so sorry you are struggling with this. For questions concerning the protocols please email my team at info@thyroidpharmacist.com and they will be happy to help you. Do you recommend Coconut sugar on the AIP diet? I also notice that on other sites the AIP diet allows for honey and/or maple syrup. What is your reasoning for excluding these sweeteners? Theodore – thank you for reaching out. For those on the AIP diet I recommend no sugars (including honey, maple syrup, and agave). The Autoimmune Paleo diet is meant to be short term; it solves the problem of leaky gut. You can find more information on this in my latest book Hashimoto’s Protocol. Thanks. My daughter is working through your protocal. Half way through. Incredible information! Thank you, as many have said, for taking the time to reply to everyone’s comments. My issue is this – family history of hypothyroidism, I have been tested and my level is in the “normal” range but I know something is wrong. After a bit of research, I am seeing a major connection to my thyroid issues and my extreme sensitivity to nickel through food sources. Any tips you can give me to help me work on both issues at the same time? I know I need to start with going gluten free, but from there? I truly believe there is a connection between the two and would explain lots of issues in my family’s medical history.